First off I should establish my bona fides for reviewing a book like this (i.e., science): I have none! My interest in astronomy & its relatives goes back to when I was 8 and entertained the idea of becoming an astronomer. Alas, I have no head for math and only my 9th grade science teacher was any inspiration at all so I wound up in the humanities (not that I regret it, given my talents and interests I didn't make the wrong choice). I am but an amateur dilettante who can only watch from the bleachers. My lack of credentials firmly established, this is a very interesting read. 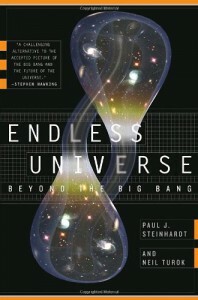 The authors are the originators of the only serious contender to the dominant theory about the origins of the universe, the inflationary big bang theory. Their version is called "the cyclic universe" theory. They identify several areas where the IBB is deficient; the most telling being the lack of a source for inflationary energy. But perhaps I should back track a bit: The "inflation" in IBB refers to a period right after the big bang when space/time expanded at an enormous rate, far faster than it had been and did subsequently. This inflationary quirk had to be introduced to the original big bang model because, otherwise, cosmologists couldn't explain why the universe looks the way it does today. This aspect of the big bang theory has always bothered me, actually. It seems rather arbitrary to simply introduce a condition in order to make your theory work out (though there is enough circumstantial evidence to make it plausible). The authors attempt to resolve the dilemmas faced by the IBB by postulating that our universe is but the latest in a cycle of universes that have been created, lived & died. There may be no beginning (which would have Aquinas rolling in his grave) and no end to the cycles (which last about a trillion years). Space and time existed before our universe emerged and don't have to be created ex nihilo; and previous universes may have had an influence on the structure of ours, which would explain why ours is so congenial to our lifeform. They can do this by relying on the characteristics of the latest incarnation of string theory -- M theory. This is probably the weakest part of their argument since string theory has lately come under some fierce attacks and it may turn out NOT to be the answer to "life the universe and everything" afterall (besides we all know it's 42 anyway). I like their theory anyway. It's more elegant than the IBB and aesthetically pleasing (which, of course, is not definitive) and the authors present it very clearly. I'd like to think their solution or one similar to it is the correct one but I'll enjoy watching how things turn out over the course of the next few years.